In early 1980’s, Tony and Lyn Carter, founders of Rammed Earth Enterprises, renovated an old home and then designed and built their own first home from mud brick in Central Victoria. This home featured not only hand-made mud bricks, but also crazy slate flooring, cypress pine ceiling lining and recycled materials (such as windows, structural posts, sinks and taps). Much of the timber used in construction was milled from dead Ironbark trees found on the land and recycled Ironbark was used to build a staircase. They recycled coloured bottles to make a feature window on the east and manufactured their own kitchen from ironbark timber. 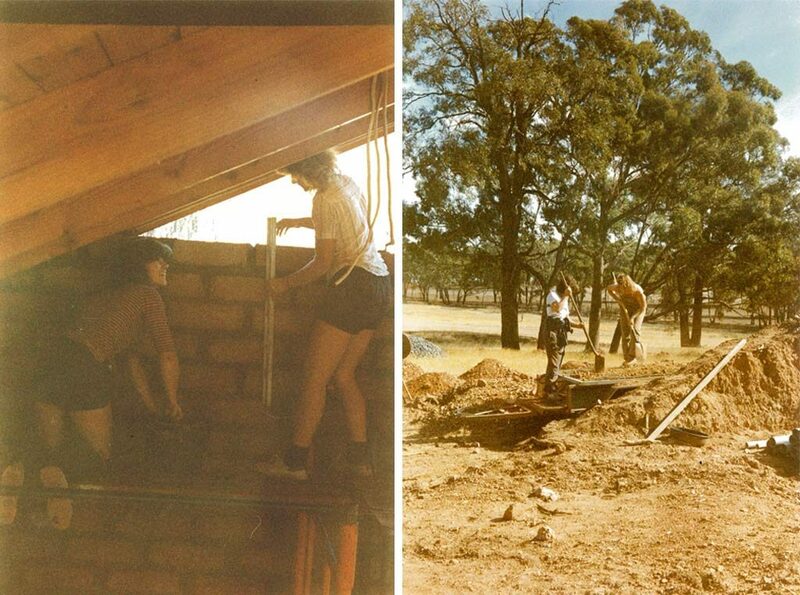 Lyn building their first home – a Mud Brick cottage. Tony building their first home – a Mud Brick cottage. Needless to say, a passion for earth building, solar passive design, natural materials, recycling, and sustainability has been inherent in their constructions from this time and still continues today. 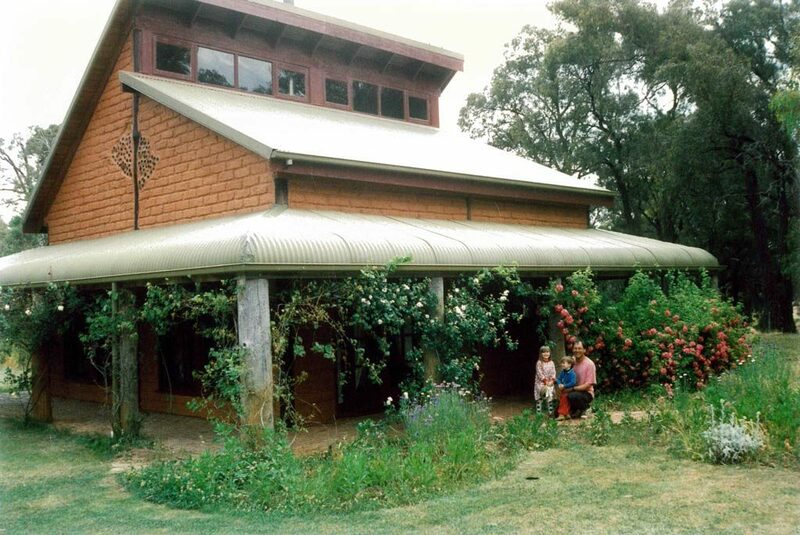 Lyn and Tony’s first home – a Mud Brick cottage. 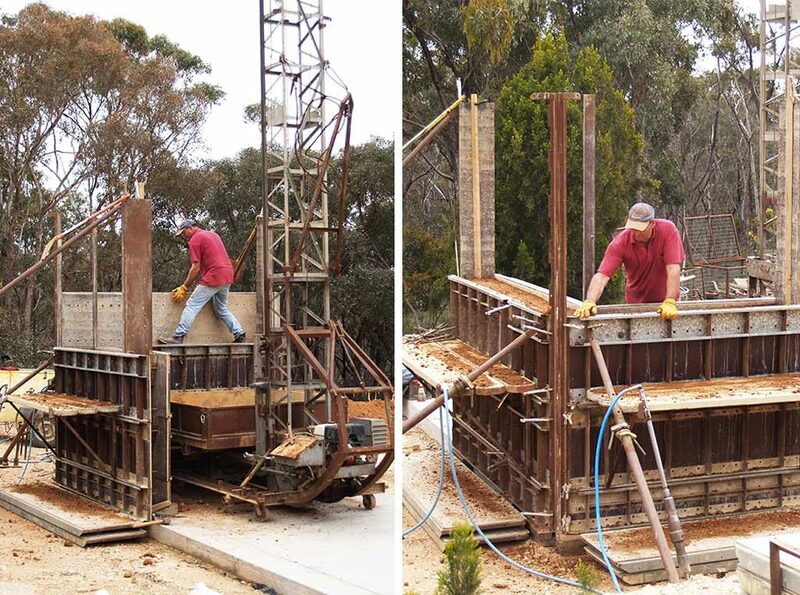 In the early 1990’s Tony and Lyn moved on to research Rammed Earth as a medium and travelled to WA, where at the time Rammed Earth had been utilised for many years; In 1990 25% of all new building permits were for Rammed Earth homes in Margaret River. Tony became a registered builder in 1992, and began trading as Rammed Earth Enterprises, a small boutique company specialising in Rammed Earth Dwellings. 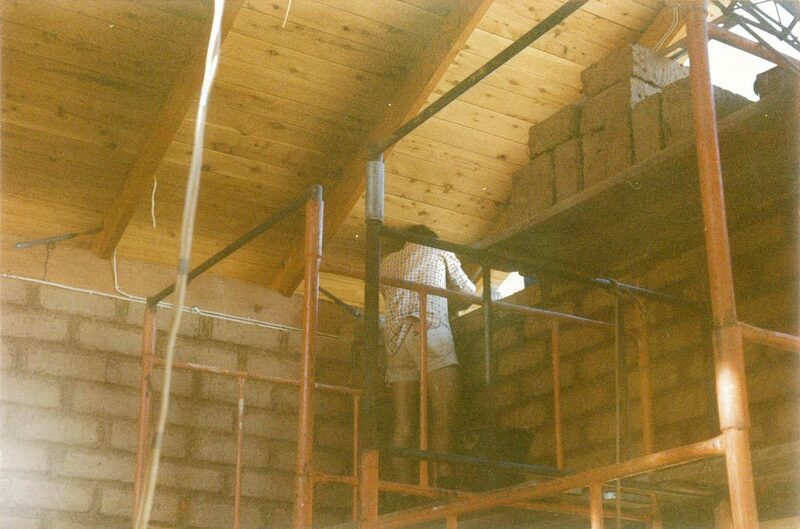 Tony building Rammed Earth walls. Being a specialist builder of Rammed Earth dwellings, they were called all over the state and interstate to build in this very distinguishing medium. The furthest builds were in the Northern Territory on an out-back station, with Tony training the Aboriginal station hands in ramming the walls on the construction of a second homestead. When Tony returned home after this project (just in time for the birth of their second child) he was phoned by the local doctor in Borroloola and asked if he could construct the Rammed Earth walls for his new home on an aboriginal reserve before his equipment was taken home. The whole family returned for this project when the new baby was only 7 weeks old. Because of the distinctive nature of the Rammed Earth medium, the Carters quickly began working with clients to design their own unique homes, as well as building architectural designs that clients bought to them. With the introduction of the new 5 star energy rating system, and with the business expanded into extensions, renovations, and the construction of new homes utilising a variety of mediums, Tony and Lyn decided to introduce a new business name. In 2006 Eco Sustainable Homes was born, while keeping the trading name of Rammed Earth Enterprises. Commercial projects with Rammed Earth work were undertaken with owner builders and with other registered builders, while Eco Sustainable Homes retained the building and design side of the business. In 2012 the business was split and Tony and Lyn now trade with Rammed Earth Enterprises Pty Ltd. as the subcontracting Rammed Earth wall building business, and with Eco Sustainable Homes Pty Ltd as the registered building business for those clients looking for a builder/designer as well. Rammed Earth is one of the oldest forms of construction. It dates back to the time of semi-nomadic man in the Middle East, predating mud brick and was used in the construction of the Great Wall of China and other monumental structures of ancient times. With the specialised formwork used by Rammed Earth Enterprises, earth wall construction has been lifted from a basic material chosen by economic and environmental necessity, to a distinctive medium chosen for its beauty, strength, durability, environmental and functional advantages. The specialised Rammed Earth formwork we utilise has been developed and improved over the last 40 years, and enables our clients versatility in the design including the capability of incorporating angled corners, curved & raked walls, portholes, niches, arches and walls of any length & thickness, up to 9 meters in height. Our rammed earth walls are highly durable and are sealed with a clear dustproof and water repellent sealant making them maintenance free.